Last week I came in to possession of a lot of bananas and what do you do if you have lots of bananas? Make banana bread of course! I've made some plain stuff before and was looking for something a bit different. 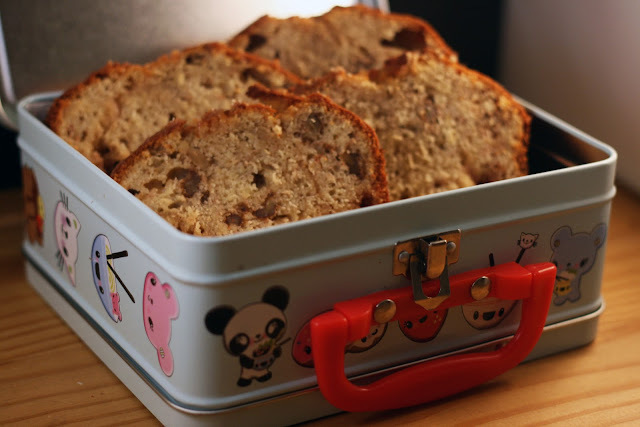 I came across this recipe and was sold, nuts, fudge and banana bread... amazing! I made a few substitutions, I used plain fudge from Morrisons because they didn't have squidy werthers originals and I used walnuts because they're cheaper than pecans because although I'm no longer a student, I'm still poor! Even with the substitutions it was seriously yummy, my favourite part was the melted fudge! I definitely recommend it! Looks yummy Heather. Love the cute lunch box!! I couldn't bring myself to buy fudge (would ruin my nutrition/health education cred if seen) but it's a lovely way to treat bananas.